Home/People and Sound/Communication/How is sounds used to transmit data underwater? Computers use digital data to transmit and receive information including e-mail messages and Internet web pages. Is it possible to transmit this kind of data underwater? Can a submerged submarine send and receive e-mail? Submarines do not have telephone or cable connections, and radio signals do not propagate underwater, so a submarine relies on sound to send and receive digital data. The page on communicating underwater explained how underwater telephone systems use sound to communicate underwater. These systems produce very low quality signals, similar to poor telephone connections that cellular phones often experience. Telephone modems allow computers to transmit and receive information over telephone lines; however, they do not work very well with poor connections. Special acoustic modems that can successfully transmit digital data underwater have been developed. These modems convert digital data into special underwater sound signals that can be transmitted between two submerged submarines or between a submerged submarine and a surface ship. These digital signals can represent words and pictures, just as on land, allowing submarines to send and receive e-mail. Underwater acoustic modems are relatively slow compared to telephone or cable modems on land. Nonetheless, this technology is very important because it provides an accurate and efficient means to send and receive data underwater. Basic Acoustic Communication Model. Diagram courtesy of Benthos, Inc. In addition to submariners, researchers also need to send and receive data underwater. Oceanographers use acoustics to control underwater instruments and acquire the data that they collect remotely. This technology can also be used to control small, unmanned submarines, called Autonomous Undersea Vehicles (AUV’s), and get data back from them in real-time. These vehicles are currently under intensive development and are beginning to be widely used for oceanographic research and other purposes. Acoustic links are used to control underwater instruments and acquire the data remotely. Diagram courtesy of Benthos, Inc. Autonomous vehicles working under the ice can be controlled and their data can be transmitted to a topside station using underwater acoustic links. Diagram courtesy of Benthos, Inc. Underwater data links can also be combined with satellite data links to provide data in real-time from instruments on the seafloor to scientists ashore. One application of this technique is to provide early warnings of tsunamis generated by undersea earthquakes. Tsunami waves are generated when an earthquake causes the seafloor to move. They can cause great damage when the waves build as they come ashore. Pressure sensors that are deployed on the seafloor can detect tsunamis. The U.S. National Oceanic and Atmospheric Administration (NOAA) Deep-ocean Assessment and Reporting of Tsunamis (DART) program has installed bottom pressure sensors near regions with a history of tsunami generation, to measure waves as they spread. To date, NOAA has created an expansive network of 39 DART buoy stations, with 32 located in the Pacific and 7 in the Atlantic Basin. 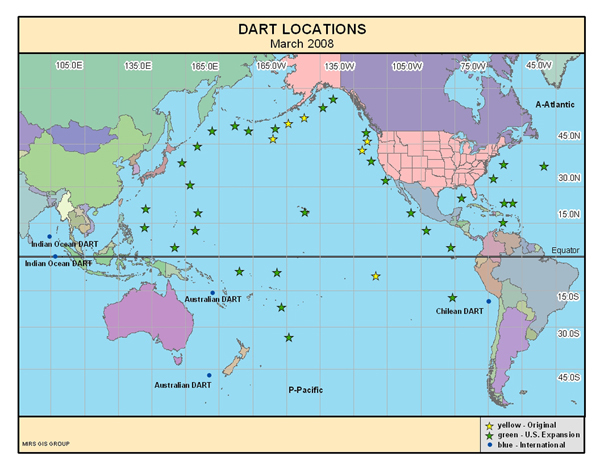 NOAA’s DART buoy locations. The network of 39 stations provides coastal communities in the Pacific, Atlantic, Caribbean and the Gulf of Mexico with faster and more accurate tsunami warnings. Image credit: NOAA. For an interactive map with real-time, DART buoy data, please see: www.ndbc.noaa.gov/dart.shtml. Pressure data are transmitted to a near-by surface buoy via an acoustic data link using underwater modems. The data are then relayed to researchers on land in real-time via satellite. Researchers can also request real-time data independent of the automatic detection system. The data are used to provide early warnings of a tsunami before it comes ashore. To view an animation that shows how the system works, please see this NOAA animation for the DART System. Close-up of a DART II surface buoy. 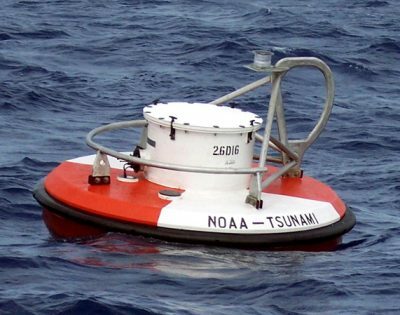 An acoustic link transmits data from the bottom pressure sensor to the surface buoy, and then satellite links relay the data to NOAA tsunami warning centers, giving NOAA forecasters real-time data about tsunamis that could potentially impact coastal areas. Photo courtesy of NOAA. 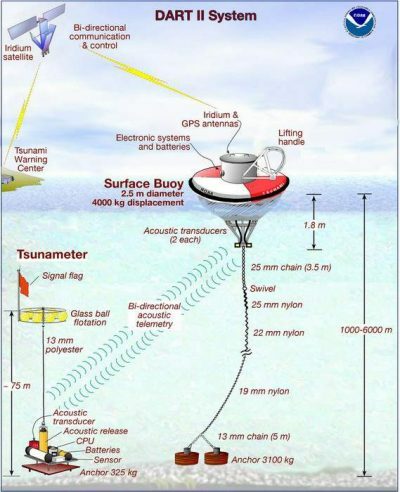 Schematic of a NOAA DART II Buoy Station. Each DART station consists of a bottom pressure sensor anchored to the seafloor and a moored surface buoy. Schematic courtesy of NOAA. Another practical example for the use of acoustic communication technology is in the search for underwater objects. A robot crawler carries a modem, a camera, and a digital signal-processing unit. The robot, transversing the seafloor, searches for an object. When an object is found, the robot sends an acoustic signal to a ship or shore based station. The robot can then be commanded to take a still frame photo, compress it and transfer the image to an acoustic signal that is sent back to the investigator. This technology will allow archaeological expeditions to save thousands of dollars in diving time. 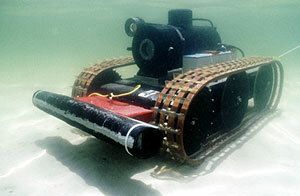 Robotic crawlers can carry sensors into very shallow water, or even into the surf zone. This robotic crawler, equipped with a camera and modem, can be controlled from substantial distances via acoustic communications. Photo courtesy of Benthos and the Naval Coastal Systems Station. 13 June, 2000., Submarine sends underwater e-mail. BBC News. Green, D. (2002). Large Area Monitoring of Marine Environments. In Seoul Ocean Seminar of the 1st APEC Ocean-Related Ministerial Meeting, Proceedings April 22-23. Seoul, Korea.